The Large Hadron Collider (LHC) at CERN has stopped in the spring to undergo a major consolidation program but this has not stopped the search for new physics. On the contrary, physicists are taking advantage of the interruption to finalise all analyses with the whole data collected so far. Dozens of new results have been presented by the four LHC experiments at several conferences since the end of operation. While only a handful of these results have made the headlines, a wealth of new information is now available, allowing theorists to refine their models. Even with the discovery of a Higgs boson, physicists know that the Standard Model of particle physics cannot be the final answer since it has known shortcomings. For example, it fails to provide an explanation for dark matter or why the masses of fundamental particles such as electrons and muons are so different. Another theory called supersymmetry (or SUSY for short) is one of the most popular and most promising ways to extend the Standard Model, but it has yet to manifest itself. One major difficulty when testing this new theory is the large number of parameters it introduces. To find the new particles predicted by SUSY, we must explore a vast territory spanned by 105 dimensions, corresponding to its 105 free parameters. Finding these new particles is like trying to spot a stranger in a crowd of millions. Fortunately, theorists have attempted to give us experimentalists some guidance to constrain these parameters using theoretical or experimental considerations. One model that has gained popularity lately is called the phenomenological Minimal Supersymmetric Model or pMSSM and uses only 19 parameters. It takes into account information from all aspects of particle physics, incorporating constraints from the measured characteristics of the Z and Higgs bosons, b-quark physics, astrophysics as well as direct searches for dark matter at underground facilities and supersymmetric particles at the LHC. Several groups of theorists and experimentalists have combined all these recent results to see which areas of the reduced but still huge parameter space of the pMSSM model are still allowed. Their approach consists in generating millions of possible values corresponding to the masses and couplings of the hypothesised SUSY particles. The couplings are quantities related to the probability to produce these particles at the LHC. Then they impose various constraints obtained from the many quantities measured by past and current experiments to see which points among all possibilities are still allowed. 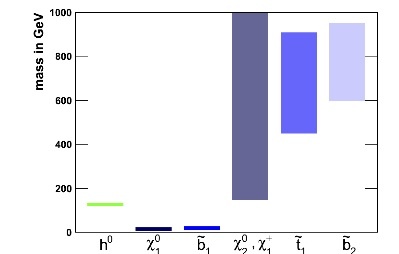 Two theorists, Alex Arbey and Nazila Mahmoudi, and experimentalist Marco Battaglia, contrary to their earlier work, performed their latest scan assuming the four positive results reported by direct dark matter experiments were true dark matter signals to see if these results could be explained within SUSY. While attempts by other groups were not able to find SUSY scenarios in agreement with the parameters of the possible dark matter signal, their results were rather surprising: they found surviving scenarios pointing to a light neutralino, with a mass of only 10 GeV, twelve times lighter than the Higgs boson. The second lightest particle is the super partner of the bottom quark, called sbottom, at around 20 GeV. The mass ranges predicted for different SUSY particles coming out of this study. The Higgs boson discovered last summer, h0, is assumed to be the lightest of the five Higgs bosons predicted by SUSY and the lightest SUSY particle is the neutralino, χ0. If this scenario were correct, why would such a light particle have escaped detection? The reason is that most searches led by the CMS and ATLAS experiments have focused so far on events where a large amount of energy is missing. This would be the case when some heavy but invisible SUSY particle escapes from our detectors. Such criteria are needed to reduce the overwhelming background and isolate the few events containing traces of SUSY particles. But a light neutralino would only carry a small quantity of energy and would have gone undetected. While theorists are assessing which corners of the parameter space are still allowed, experimentalists are evaluating the impact of their selection criteria on detecting particles having the characteristics of the remaining allowed regions. New strategies are now being sought to explore this possibility. Operating the LHC at higher energy and collecting larger datasets starting in 2015 should give definite answers to these questions. These combined efforts may soon pave the way to new discoveries.